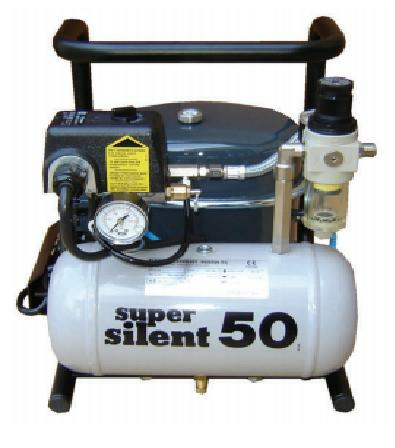 The Silentaire Super Silent 50-TC Ultra-Quiet Compressor is true to its name, giving the user a noise-free environment while not compromising on air compressor performance. Airbrush artists have a difficult passion in that they constantly breath in contaminated air, full of harmful paint fumes and solvents because of it. With the Silentaire Super Silent 50-TC Ultra-Quiet Air Compressor, there will be no more fumes and no more dust to clog up your sinuses and irritate your lungs. Your ears will be pleasantly surprised to find out that having clean air does not mean that you have to compromise your noise comfort level. The Silentair 50-TC is virtually noiseless while it works to clean the air around you and throughout your arts and crafts studio. This heavy-duty air compressor comes with a 0.9 gallon tank, 2.0 CFM Free Air, safety valve, air intake filter, and carrying handle. The motor is 1/2 Hp, boasting a 15+ year longevity potential. You are sure to enjoy your airbrush art more completely and safely. Ranging form 1/5th to 1/2 horsepower in a selection of configurations, including optional 220volt/60Hz and 220volt/50Hz, there is a Super Silent air compressor that is right for you.